Lock in a great price for Hotel Byzantino – rated 8.4 by recent guests! We always enjoy staying at the hotel and are warmly welcomed back. The beds were firm and very comfortable. Our room was very quiet with a small balcony on to a side street. There is a nice reception and coffee area where you can relax out of the sun. The staff are very friendly and it was very efficient. It is very central - 8 mins from the cathedral, in a nice pedestrian shopping area with lots of cafes. The staff of the entire Byzantino hotel were truly wonderful and professional. I will certainly recommend this hotel to any person in America and Europe. Nice breakfast room, many options for breakfast. Very central location and big rooms. Great location. Tasty breakfast. I would add some fresh fruits though. 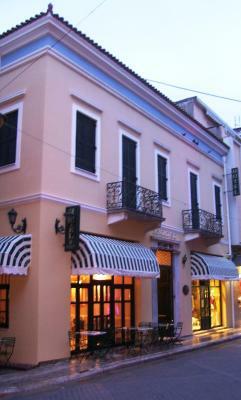 Great location in a very lively pedestrian area of Patras. Rooms were spacious and a little bit dated but everything was clean, comfortable and worked as expected. The café and breakfast area were particularly cozy and pretty with a very nice feel to them. Warm welcome, lovely room with its own balcony. Perfect place to explore the town from. Lots of interesting bars nearby to have a drink as well as having its own restaurant. Very good breakfast. 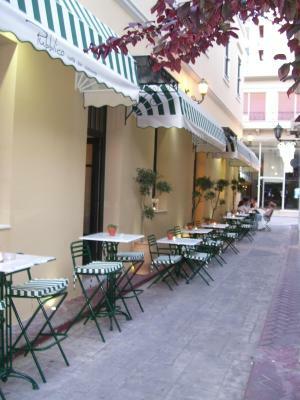 Good location on the main pedestrian area close to bars and restaurants. Nice old world feel. Hotel Byzantino This rating is a reflection of how the property compares to the industry standard when it comes to price, facilities and services available. It's based on a self-evaluation by the property. Use this rating to help choose your stay! Built in the late 19th-century, this luxurious hotel is located on the Riga Feraiou pedestrian street near Patras’ City Hall and its shopping district, offering stylish accommodations with free internet access. Each of Hotel Byzantino’s guest rooms is well-appointed with modern comforts and tastefully decorated. 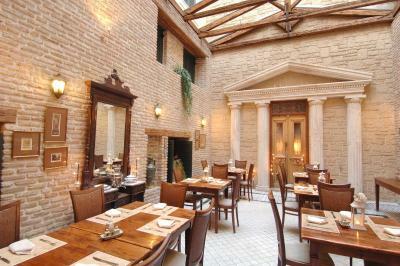 Byzantino has retained its historic features, adding to its unique charm and elegance. Guests can still admire the original pillars and features, combined with modern décor and antique furnishings. Pubblico, the hotel restaurant, serves Greek and Mediterranean dishes. Hotel Byzantino also hosts a folk art shop and Kompoloi Museum, as well as a women's clothes shop, providing beautiful gift solutions. Guests wishing to further explore Patras can rent a car through the hotel. Private 24-hour parking is possible at 100 feet and charges are applicable. When would you like to stay at Hotel Byzantino? Hotel can also provide a computer, as well as baby sitting, dry cleaning and hair dressing services upon request. The hotel can also provide a computer, as well as baby sitting, dry cleaning and hair dressing services upon request. The air conditioned suite is decorated with stylish furniture and warm colors and features LCD TV, mini bar,and safety deposit box. The marble bathroom is equipped with hydromassage and hairdryer. Built in the late 19th century and fully renovated in 2002, it combines the beauty of classic style with the modern amenities needed by travellers. The hotel is located in the centre of Patras, on the pedestrian Riga Feraiou street, next to key locations such as the Town Hall and V. Georgiou Square. It is also very close to the port and the long-distance transport stations. House Rules Hotel Byzantino takes special requests – add in the next step! Hotel Byzantino accepts these cards and reserves the right to temporarily hold an amount prior to arrival. Please note that there are connecting rooms available. Nice location. Variety on breakfast. Wifi in my room was practically non-existent. The room was noisy during the night. The bathroom was also cold and dated. Great location and spacious rooms. Quite disappointing, comparing to its glorious past.Towels for one, while the reservation was for two. We called the reception and they fixed it. No slippers and extra towel for the bathroom; we called again and they responded quickly. I would not expect to ask for amenities considered "standards" for hotels like this. The rooms do not absolutely meet the standards of a 4 star hotel. They have not been renovated since years (see pictures). The person working at the lobby seems clueless and is mostly unhelpful. Very central location, close to shops and restaurants. THE BATHROOM NEEDS REPAIR AND A PART OF A WALL IN MY ROOM HAS HUMIDITY PROBLEM . Beautiful huge rooms in a beautifully restored antique building. Make sure you ask to stay in the building opposite the main hotel for them, the rooms in the hotel itself are like boxes! Restaurant food was pretty poor. Reheated spaghetti and a fairly tasteless burger.